Good news to all Cagay-anons! 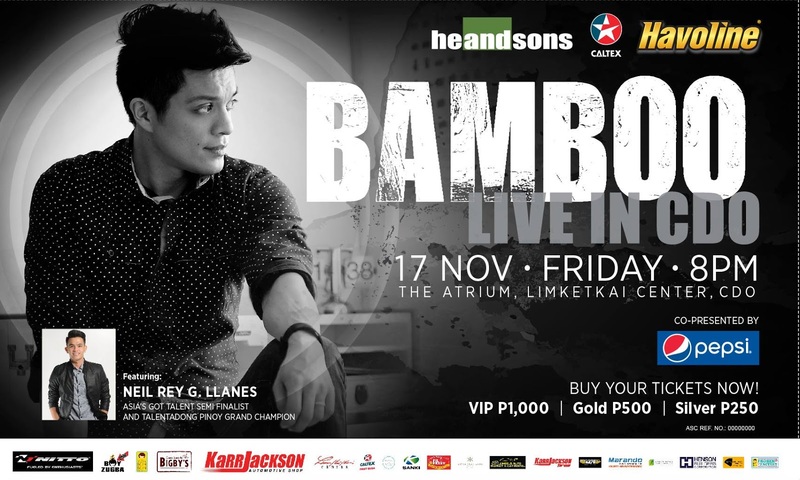 HE and Sons Corporation together with Caltex and Havoline will be bringing Bamboo Live in CDO this November 17, 2017, Friday, 8 PM, at the Atrium of Limketkai Center in Cagayan de Oro. This is the most anticipated event in CDO this November and an early Holiday treat for Northern Mindanao. It’s Bamboo Live in CDO! You are going to hear the former Rivermaya Vocalist now The Voice PH coach for the Camp Kawayan Team - Bamboo Mañalac sing your favorite songs LIVE like Noypi, Tatsulok, Masaya, Peace Man and many more. The concert is co-presented by Pepsi and will be featuring Asia's Got Talent Finalist and Talentadong Pinoy Grand Champion, Neil Rey Llanes! So, what are you waiting for? Grab your ticket now before they're sold out to the public.